Four-time Tony Award winner Audra McDonald and veteran movie and television star Peter Graves join with the Mormon Tabernacle Choir and Orchestra at Temple Square in an extraordinary musical Christmas celebration. This spectacular performance of the Choir's 2004 Christmas concert also features a special guest appearance by the prima ballerina from Ballet West, Utah's highly acclaimed dance company, performing two selections from The Nutcracker. Capturing the musical spirit of the season, the program blends traditional and contemporary favorites such as "Angels from the Realms of Glory, " "Deck the Halls, " "Have Yourself a Merry Little Christmas, " "Silver Bells, " and "We Need a Little Christmas." Poignant African-American spirituals such as "I Wonder as I Wander" and "Sweet Little Jesus Boy" showcase the remarkable talents of Broadway singer and actress Audra McDonald. A memorable narration of "In Search of the King" based on story by Henry Van Dyke and a reading of the Christmas story from the New Testament by Peter Graves add to the rich variety of the program. This magnificent presentation will be a holiday favorite for years to come. 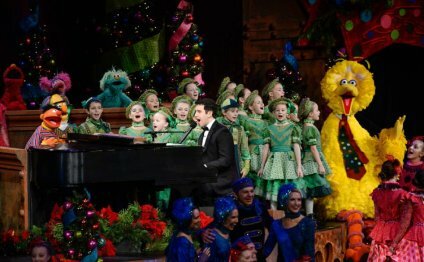 The Mormon Tabernacle Choir Presents "Once Upon a Christmas"